The full-color Guess What! Teacher's Book Level 6 is interleaved with the Student's Book and offers pathways to help adapt the material to individual schedules. 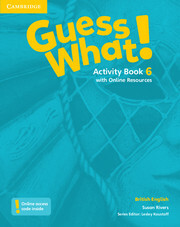 It contains: Step by step guidance for each lesson, including a summary of lesson aims and materials needed, simple warmers and end of lesson activities, audio scripts, and answer keys. There are photocopiable word cards for each unit to match the flashcards, extra games and activities for every lesson, and a Games bank which can be used as a dip-in resource. There is also a DVD with captivating videos to accompany the CLIL lessons.